My sister who lives here in Portland watched on EWTN the Mass I celebrated at the Basilica of the National Shrine of the Immaculate Conception on April 28. One of her comments (after she finished making fun of her younger brother!) was about how Holy Communion was received. She remembered with some real fondness how, when we were children, we always received Holy Communion at the Communion rail and on the tongue. No one dared touch the Holy Eucharist, except the priest. Whatever anyone reading this thinks about the current practices regarding the distribution of Holy Communion, the rationale behind the former discipline was a profound sense of reverence and awe for the presence of our Lord in the Blessed Sacrament. It is not just a symbol or sign. Jesus Christ is truly present, body, blood, soul and divinity in the Holy Eucharist. That’s what Catholics believe. But our liturgical and sacramental practices far too often do not reflect that profound understanding and faith in the Real Presence. The story is told of a Protestant minister who was invited to attend Mass. Afterward he was questioned on what he thought. He replied that he did not think that the congregation really believed in the Real Presence. When asked why he thought this, he said that he personally did not believe in the Eucharist as Catholics do, but if he did, he would approach our Lord for Communion walking on his knees. He found the casual and irreverent attitude at the time of Communion in that particular church very unconvincing. As part of a new Liturgical Handbook for the Archdiocese of Portland to be released on the Solemnity of Corpus Christi (June 3), and after consultation, there are two changes in practice I am implementing with regard to our understanding and reverence for the Holy Eucharist. Please consider this a “teaching moment” for all of us. As shepherd and teacher of the faith, and as the one ultimately responsible for the liturgical life of the Archdiocese of Portland, my intent is to foster greater devotion to our Lord in the Blessed Eucharist and in the Holy Mass. We will return to the practice of kneeling after the Agnus Dei (Lamb of God). The current practice is to remain standing, which has been an exception to the universal norm of kneeling that has been perfectly legitimate and permitted by the liturgical norms. Nevertheless, returning to the practice of kneeling at this moment in the Mass will foster a greater reverence for our Lord. The priest at that moment is about to hold up before the congregation our Blessed Lord in the Holy Eucharist and proclaim, “Behold the Lamb of God.” It seems most fitting that we be on our knees before the Lord for such a proclamation of faith. In the Book of Revelation, when the Lamb of God (Christ) is presented before the throng of heaven, all fall down in worship before him. The Mass is a participation in this heavenly liturgy. The second change coming is that, in the absence of a priest to offer Mass, the distribution of Holy Communion on weekdays in the parish church during a “Communion service” will no longer be permitted. This does not affect such Communion services in nursing homes, prisons, etc., where the people do not have the opportunity to attend Mass on Sunday in the parish. There is an intimate and intrinsic link between three realities that is essential in this context. They are the offering of the Holy Sacrifice of the Mass, the priest who ministers in the person of Christ, and the distribution of Holy Communion. These are not to be separated except for serious reasons and pastoral need. As long as the faithful have the opportunity to participate in Mass and receive Holy Communion on Sunday, there is no such pastoral need to receive Holy Communion outside of Mass. When we go to Mass, we are there to do much more than just receive Holy Communion. We participate actively and consciously in the offering of Christ, the Paschal Victim, through the hands of the priest, who ministers in the very person of Christ at the altar. From this sacramental offering, we receive the Body and Blood of the Lord, thus culminating our participation in the paschal mystery being celebrated. This is the way the Church has always viewed this. The Church never envisioned breaking them apart by distributing Communion outside of Mass. This is only done for the sick and those otherwise unable to participate in the Sunday Eucharist. To do otherwise is very poor sacramental and Eucharistic theology. 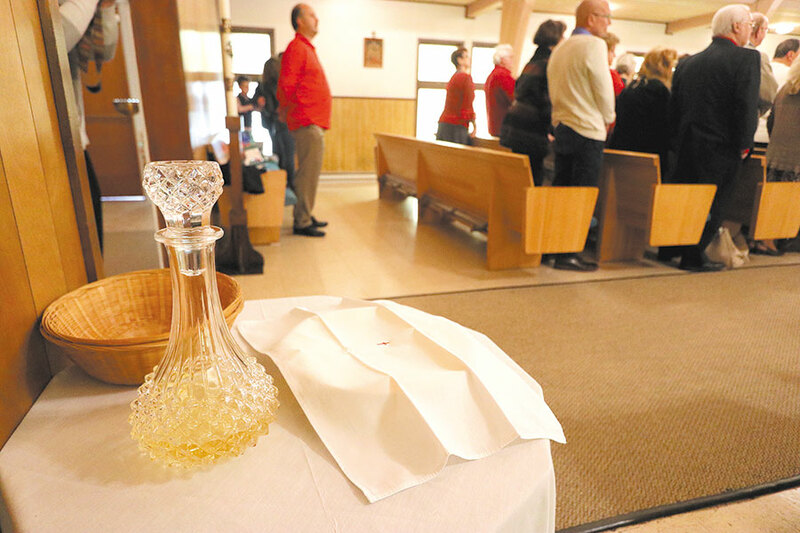 When Mass cannot be offered on a weekday in a particular church, parishioners are invited to experience the wider Church by attending daily Mass in a neighboring parish. The faithful can also gather for other forms of prayer, and our Office of Divine Worship has prepared a prayer service for such occasions that include parts of the Liturgy of the Hours with readings from the Mass of the day. This is a way to experience another form of the Church’s liturgical prayer. These changes may take some time for adjustment, but I am confident that they will lead us to a more profound reverence for the most precious gift of the Holy Eucharist, and a more informed, conscious and active participation in the Holy Mass. And a greater love for our Lord in the Mass and in the Blessed Sacrament will lead to a greater love of neighbor and service to the poor. When I hold out my hands for the Eucharist, I am cradling Christ and receiving the Body of Christ into me - the Body of Christ. I do not want to be forced to receive on my tongue. I can't kneel. I don't want to be forced to kneel. Reverence for my God is in me. This comment has been hidden due to low approval. HI I submitted a comment questioning the liturgical changes, but see you did not post it ! Only comments posted are people agreeing with changes!!!! In the spirit of dialogue please be transparent and post ALL comments, not just the ones supporting the change !!! This comment has been hidden due to low approval. To return to kneeling after the Lamb of God engulfs the mass in personal devotion, piety and a further retractionist move from the spirit of Vatican II and the essence of Eucharist celebrated as community gathering to be sent forth. This comment has been hidden due to low approval. Bravo Bishop Sample!!! God Bless You! This comment has been hidden due to low approval. God bless you, Archbishop, for all that you are doing. May your fold multiply. This comment has been hidden due to low approval. I hope sometime soon we can return to receiving the Most Holy Body and Blood of Christ on the tongue. I have heard we are the only country who receive in our hand. I do miss kneeling on the first step to the altar to receive. One more sign of our reverence for the Blessed Sacrament. Thank you! This comment has been hidden due to low approval. Thank you, Your Excellency, for teaching the Catholic truth! The Church is blessed to have you--and others--in the succession of the Apostles. Would to God that ALL bishops of the Church would teach the truth of Holy Mother Church, in season and out of season. May God Bless you always. This comment has been hidden due to low approval. Thank you, thank you, thank you, Archbishop Sample for returning us to a more reverent adoration in the presence of Our Lord. We should all be on our knees in the presence of God. This comment has been hidden due to low approval. Thank you instituting these changes, Archbishop Sample. It would also be great to create a norm among the faithful that we need not receive Communion every time we assist at Mass. Too often, I'm afraid that there's a feeling that others will judge us if we make a Spiritual Communion instead. This comment has been hidden due to low approval. This is a wonderful post. Thank you Most Rev Alexander Sample and may God bless you. We need to have reverence and awe as right now it is missing from the communicants. This comment has been hidden due to low approval.